Jack McCaffrey will be shouting on the Dublin footballers tomorrow. CONTRAST THESE Sundays in Croke Park. Jack McCaffrey was at the heart of the battle, helping Dublin fight a monsoon and Kerry. They ticked the boxes, lifted Sam and McCaffrey spent the winter with the tag of the best footballer in the country. Jack McCaffrey will take his seat in the stadium, one of thousands of Dublin fans watching on with the simple task of roaring their team on to try to retain Sam. He got a taste of it at last month’s epic Kerry collision, filing through a turnstile instead of running out of the tunnel. “I suppose as I was walking in with my brother and I was thinking on the way in, ‘would you be a bit sickened if you saw Dublin go on and win it?’. “And then as soon as the ball was thrown in, that all goes out the window. It was great. Sitting out stems from McCaffrey’s decision last spring to get up, get out and see the world. 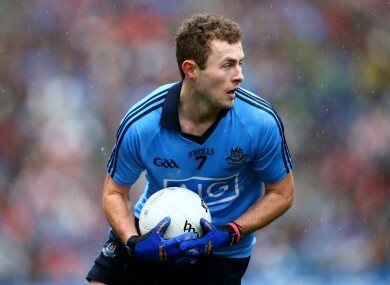 When Dublin played Mayo in Castlebar in the league in February, McCaffrey was sprung from the bench as a substitute. By the time of Dublin ran out next against Cork in Croke Park in early March, Jim Gavin was confirming in front of TV cameras after the game that McCaffrey wasn’t part of their plans for 2016. A fourth year Medical student in UCD, he’d broken the news to the Dublin management that he was heading to Africa. “I went over to Ethiopia with GOAL to have a look at the work the guys do there. And then I travelled down through Kenya. He embraced the experience and soaked in everything travelling had to offer. “It was fantastic. Really, really good. There was a mix of things. Going over with GOAL was a real eye-opener in terms of seeing so many different projects in a week. “It was mental and it was pretty exhausting. But it was fantastic. “Then I travelled around for three or four weeks before I met up with my classmates. So that was something that was completely new to me. “I’ve been on a train with no wifi for three days with two Chinese people, who don’t know what Gaelic football is. “Coming from a family that’s dominated by football, I had to find new topics of conversation. So it was great. A football career bristling with potential was parked. While working at the hospital in the small town of Monze in southern Zambia, he tipped away at a gym as part of his daily routine. That was done with designs on hitting the ground running for Clontarf at club level and UCD at colleges level but otherwise he left the all-consuming life of an inter-county footballer behind him. “I actually probably came back in much better shape than I’d left some how. I’d a club game after we got back in which I didn’t exactly perform to the best of my abilities, but I was able to get around the pitch which was an achievement in itself. ”I was busy with Goal and then floating around on my own, football was pretty far from my thoughts. The Donegal Dublin game was the first (I watched). “My father texted me during the week and I got on the GAA GO and sat down and watched it. After that then I was back for the Kerry game. When the clock swings to half three tomorrow afternoon, he may feels some pangs of envy at his teammates getting to star on the All-Ireland final stage. But on the whole, McCaffrey looked a man perfectly at peace with himself yesterday at St Brigid’s GAA club on the old Navan Road. He’d fetched up to promote GOAL’s Jersey Day next month, was keeping one eye on the watch to tear back to UCD for an exam and wasn’t holding regrets at not being currently immersed in the Dublin setup. “Probably when I was making the decision, I thought about it long and hard,” confesses the Clontarf man. “I probably second-guessed myself over a number of weeks. But no, once I made the decision I was happy with it and I was happy with how the summer panned out as well. “With college, this is the last summer really that I have to play with. So that was probably the bigger factor, rather than football. “I’m sure lads have taken years off at older stages and come back but it was college that dictated it more so. I really loved it and (it’s) something I’ll definitely (do) again at some stage in my life. Was there ever any prospect of a dramatic comeback before the final? All that of course, doesn’t mean that football has been pushed so far down the pecking order that it fails to register any more. “I’m loving the club football now and we have Sigerson kicking off soon enough. If Dublin were to ask me back in, I’d absolutely love to give it another lash. For tomorrow, McCaffrey will be cheering them on. He sent his best wishes to Dublin players early this week, knowing more than most that it’s not wise to be bothering them with contact in the hours leading up to a match. “It’s funny, it’s nearly easier when you’re out there and you can make a difference. You can run around and you’re playing football, which you know how to do. “Whereas when you’re in the stand, you’re one of 82,000 voices shouting instructions onto the pitch. But it’s a good way to pass 70 minutes. Email “'On a train with no wifi for 3 days with 2 Chinese people' - Jack McCaffrey's different summer”. Feedback on “'On a train with no wifi for 3 days with 2 Chinese people' - Jack McCaffrey's different summer”.